This week’s recipe for French Fridays with Dorie is something that on the surface would seem more appropriate for an Italian cookbook. Storzapretis are, in fact, Corsican, and the recipe comes from one of Dorie’s friends in Paris who shared her Corsican father’s recipe for these ricotta dumplings. 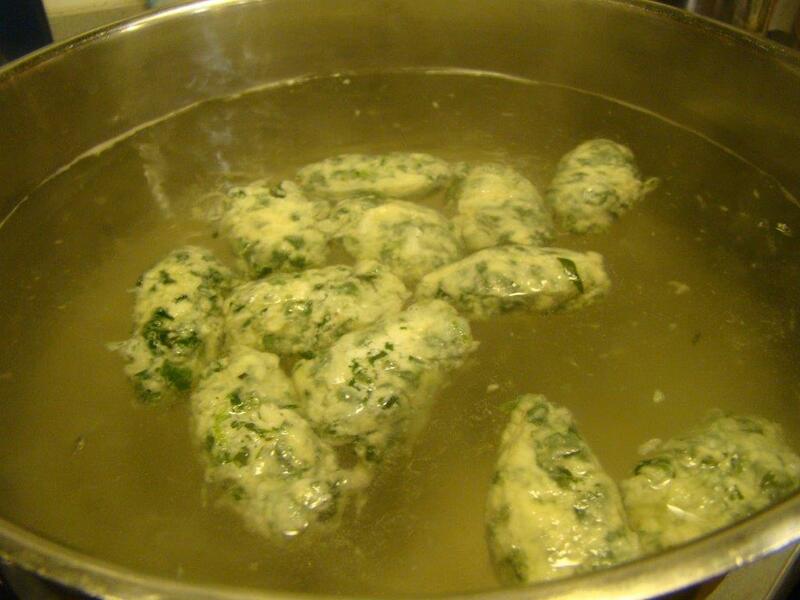 The alternate name for this recipe is “Corsican Spinach and Mint Gnocchi“, though I found it to be closer to gnudi. 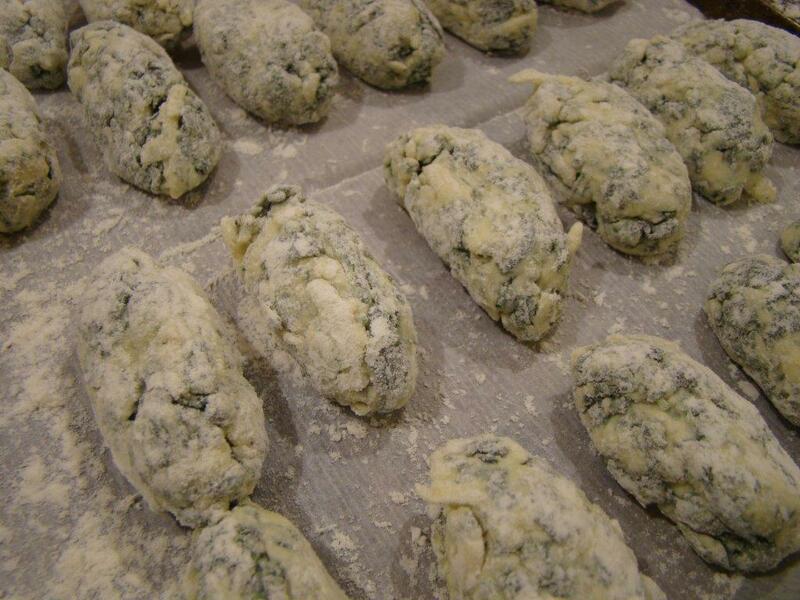 Some fingerwork on the internet uncovered the difference between gnocchi and gnudi to be the amount of flour. Gnudi uses very little flour, which was true for storzapretis too. I made gnocchi last year, and the shaping was different too. With the gnocchi, long rolls were cut into the smaller gnocchi, where the storzapretis are formed by making quenelles between two spoons. 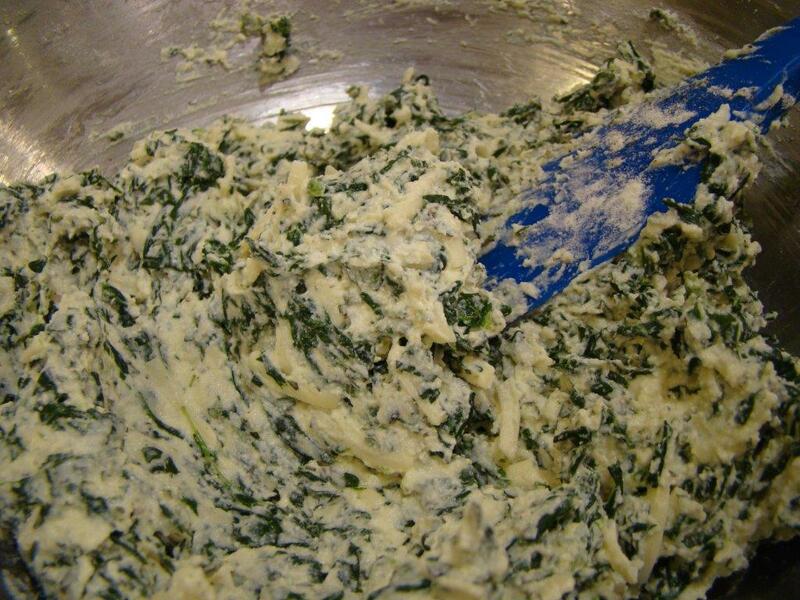 Storzapretis are made from a mostly flourless mixture of ricotta, spinach, egg, Gruyère, and fresh herbs. From its alias, I assume the recipe originally used mint, but I love the floral undertones of marjoram (an annual form of oregano) so given the choice in the recipe, I picked marjoram. After shaping the dough into quenelles and tossed in flour, they are frozen to firm up, then cooked in a pot of the gentlest simmer of water. The way the dumplings sank to the bottom of the pot, then floated up to finish cooking reminded me of making matzo balls, my favorite kind of soup dumplings. The storzapretis resemble the insides of ravioli, which might be the origin of the name gnudi, which means naked, like ravioli filling without its wrapper. Finally, the dumplings are laid out in a baking dish, covered with marinara sauce, sprinkled with more Gruyère (the French touch) and baked until it’s heated through and the cheese is melting. I enjoyed discovered something completely different. I didn’t realize how much work it would be to shape the dough though. I didn’t eat dinner until 8:30 pm, much later than intended. I liked it, but I’m not sure I’d take the time to make storzapretis again. I’m hoping leftovers taste OK because we’re having it again for dinner tonight. I don’t have any pictures to share, but on Wednesday night, I braved the frigid cold to attend Dorie’s book signing for Baking Chez Moi at the Harvard Book Store. It was so nice to see her again. She is so down-to-earth and genuine. She shared stories about life in Paris for nearly an hour and then entertained a few questions before signing books. When it was my turn, she came out from behind the table to give me a hug and kiss, then signed both the copy of Baking Chez Moi I purchased that evening PLUS my well-used copy of Around My French Table. I’m hoping to occasionally jump on the Tuesdays with Dorie bandwagon to bake from the new book, but I won’t be fully committed. To see how the other Doristas made out with their storzapretis, check out their links here. The recipe can be found here or in Dorie Greenspan’s book Around My French Table. For my American Dorista friends, because we won’t meet again until next Friday, I wish you a Happy Thanksgiving along with safe travels if you’ll be away from home. I give thanks for the many friends I’ve made on this cyber-culinary journey! Posted on 21 November 2014, in French Fridays with Dorie and tagged dumplings, French Fridays with Dorie, ricotta, spinach. Bookmark the permalink. 20 Comments. Yep, that was the killer – the shaping. Your storzapretis turned out beautifully. Happy Thanksgiving for next week! Hi Betsy, quite a committed endeavor and it seems you prepared all so splendidly. So nice you had the opportunity to see Dorie and have a personal exchange especially through your endeavors of enduring skills, taste, and endeavors, in the long term exclusive cookbook guild. Wow~ after reading how much trouble Doristas were having with this recipe & given a rather difficult week, I chose not to make them. I’m totally impressed with your efforts & explanations. Great post, Betsy. I agree that there was quite a bit of work involved making these, but I spread it out over a couple of days. I loved the flavour. So great that you got to see Dorie again! I thought about bringing my copy of AMFT for her to sign (detached cover and all), but balked at hauling it across town in the pouring rain. Dorie is a charming speaker and such a warm and lovely person. Yes, the shaping part isn’t so fun. I, too, had spread it out over a day so it didn’t seem as onerous. I’d not have been so happy if I was waiting on them in order to eat dinner. How exciting to see Dorie! The shaping was kind of tedious. For that reason I probably won’t make it again. You’re right that these taste like the filling of ravioli. I think this would be excellent inside ravioli, in fact! Doris is very genuine, sin’t she. I’m glad you were able to see her again and get your books signed. This one was interesting – I was able to get into a rhythm with the shaping, so that wasn’t so bad; but I can see where these were quirky. Happy Thanksgiving to you, Howard and Bella! Stay warm. Happy Thanksgiving to you both. 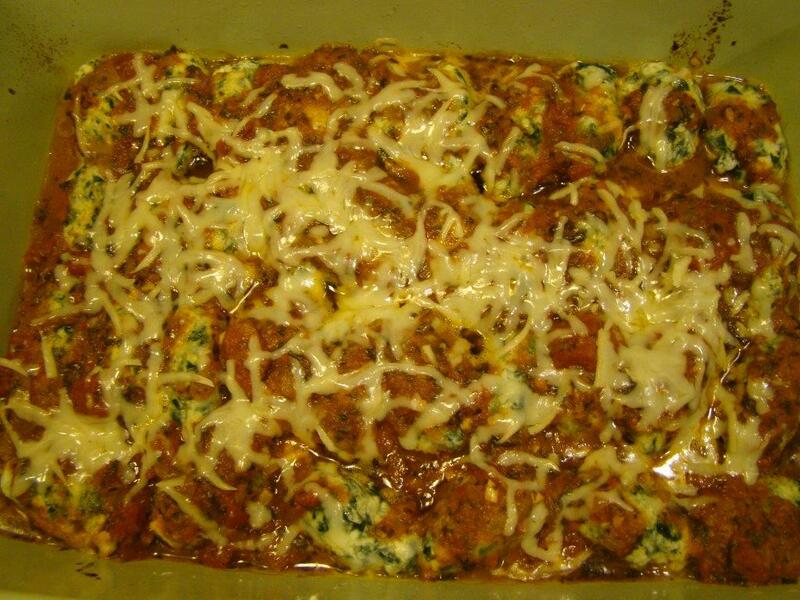 This weeks dish was really delicious, we enjoyed it. Princeton, NJ but they were fully booked. Very disappointed to say the least. At least yours tasted good after all the work… I could kick myself on this one. It was a good learning experience. A really different recipe than what we usually make. Dear Betsy, how nice that you got to meet Dorie again – I am truly jealous (in a really good way, of course) – your storzapreti look delightful and delicious and I agree with you, they were a lot of work at this time of year, a bit hard to fit in a very busy year-end schedule for all of us! Stay warm, dear friend – I saw and heard on the news that there is a lot of cold weather happening in the US. Liebe Grüsse, Andrea and have a very Happy Thanksgiving!!! So glad you got to see Dorie, and have her sign your copy of AMFT! She is so lovely and gracious! And she was genuinely happy to see all of us from TWD or AMFT. I too, enjoyed making a dish I had never heard of…although labor intensive, they were delicious! If Bill had enjoyed them, I would even try them again! A very Happy Thanksgiving to you and Howard! Happy Thanksgiving! We of course do not get Thursday off and so we usually celebrate on the following Saturday. It’s a little wierd to celebrate two days late, but I’m getting used to it, and it’s also nice to know that we (and our guests) do not have to work on the following day. This dish took me longer to make than I intended also. We ate dinner late but not as late as you. I agree with you that it is too much work to repeat. My husband really wants me to put this as a filling in something like pasta. We will see. Have a Happy Thanksgiving also! I might make these again, on a Saturdays or just days when I need to slow down and make quenelles to unwind. That’s our Dorie, alright!